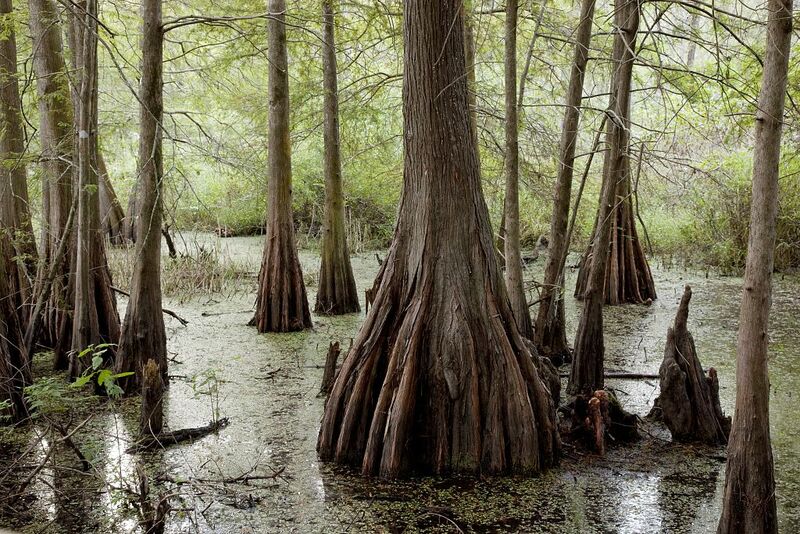 Creature story of a Louisiana gambler who runs afoul of swamp vampires while on the run from the law. Written and told by Thomas E. Fuller. Now Chancy Fox was a gambling man, and a good one. So it was just damn laziness that ran him afoul of Sheriff Black Mountain Kincaid and his two brothers, Kennesaw and Stone. That was up at Swann’s Landing, right above Meridia. Chancy may have been lazy, but he wasn’t a total fool. He was up and out of there before that fifth ace he’d tucked up his sleeve hit the table. He figured as soon as he was outside of Swann’s Landing, he’d be out of the Sheriff’s jurisdiction and free. Chancy Fox had offended something deep in Black Mountain Kincaid’s rusty soul. The Sheriff reached the limits of Swann’s Landing and just kept going. And where Black Mountain went, his brothers were sure to follow. That gambler ran south, hugging the banks of the Dark River. Past Carpenter and Egret. Past Meridia itself. And everywhere he tried to get a friendly game of cards going, here they would come, riding into town on their black horses, close as memory, relentless as death. Sheriff Black Mountain Kincaid and his brothers. Chancy Fox was getting right desperate. So he came up with a plan. He took a ride on the Blue Stag Packet steamship when it stopped for wood at Paradox. He knew the Brothers Kincaid would be right behind him. Soon as the steamer hit the marshlands, he undid the dingy tied to its side and slipped away into the night. Into the marsh he went. Twist right, twist left, twist right again. Soon as he was well in, he rowed into the grass and waited. Sure enough, another dingy came slipping past with three large men and a lantern. Chancy Fox waited for a few minutes, chuckled and stared rowing back the way he’d come. Two hours later he was still rowing. Now you’d think a man couldn’t lose something as big as a river, but Chancy managed it. He turned and turned and turned again and still couldn’t see anything but marsh grass. He was so busy not seeing things that he didn’t notice all the Cyprus trees until he was surrounded by them. Spanish moss like old men’s whiskers brushed his face and he couldn’t see for the mosquitoes. Then two things happened. He saw the huge rotting old plantation house rise up out of the darkness. And someone coshed him a good one on the back of the head. When Chancy came to, he was lying on a dank, mildewed old chaise in the middle of a dank mildewed old room. And three women were fussing over him. Well, at least they looked like women. Kinda. They were are tall and thin, like paper fold herons, and dressed in ragged finery at least sixty years out of date. And their eyes were very, very bright – and their teeth were very, very sharp. …And right hungry. And Chancy he remembered that mosquitoes ain’t the only things that drink blood. The sisters looked at each other and tittered and suddenly they were gone, like herons flying off into the night. Having effectively taken care of Black Mountain Kincaid and his brothers, Chancy Fox tipped his hat over his eyes and went to sleep. Later, he thought he heard screams coming up outa that swamp, but it was probably a dream. As day started to break, there was a dry rustling like birds with paper wings, and the sisters were back. Now instead of being tall and thin like herons, they were round and blotted like ticks and not paying any attention to Chancy. But Chancy was paying attention to them. They disappeared into the bowels of the house and Chancy waited until the sun was up full, broke three legs off a chair, and went hunting. He found them in three separate rooms, lying in three separate coffins, and without so much as a thank you, he drove a chair leg through each of their hearts. Black blood erupted all over the place, but Chancy didn’t mind. And when they were dead, they were really dead. Now if Chancy had been as smart as he thought he was, he would have found his dingy and gotten far, far away from there. But he figured ladies like that would have jewels or some such, and it took him a while to find them. But find them he did, even though it took him all day. Night was falling when he finally headed down the crumbling steps and the deep cavernous voice rumbled at him out of the night. And Chancy Fox turned and stared at the tall bulky figure of Sheriff Black Mountain Kincaid looming in the dark, his two giant brothers on either side of him. And the Sheriff smiled and his brothers smiled. And their eyes were very, very bright, and their teeth were very, very sharp. And Chancy Fox remembered a few other things about bloodsuckers. He didn’t even bother to scream as they closed in on him, their blood-soaked clothes rustling like paper wings. Yup. Looks like Chancy’s luck finally ran out. Loved every minute of this and I love this website.